JR. Firears. Custom rifles, customer feedback page. to see a screen print of original review. Click HERE to see original review. Thanks to jack from JR Rifles this is my new toy for the year, a 6mm br, ten round mag. 26 in border barrel , wildcat mod, the chassis system is a MDT ESS, Skeleton stock, Remmington 700 short action, 2 stage match trigger with Tactical Delux grip, 1- 8 twist barrel. At the top is my Rudolph T1 6-24-50 mm T3 bottom one is pulsar N870 LRF. Thanks again jack bug hole with 58 grn 75 grn 105 grn what more could you want for Mr Fox. Top guy with the latest precision equipment. Very knowledgeable and particular about his work. Did an outstanding job! Fully recommend. 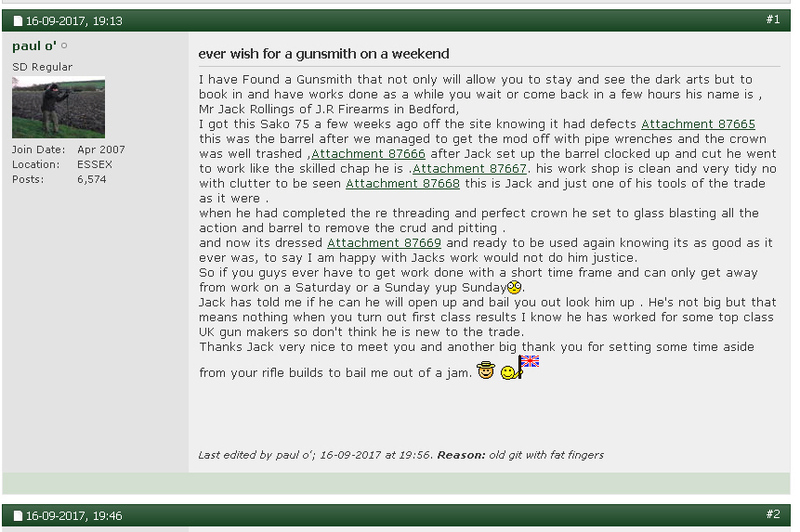 5* - if you need a gunsmith speak to Jack before you call anyone else. Fast turn around; competitively priced; good knowledge and most importantly of all - exceptional workmanship. 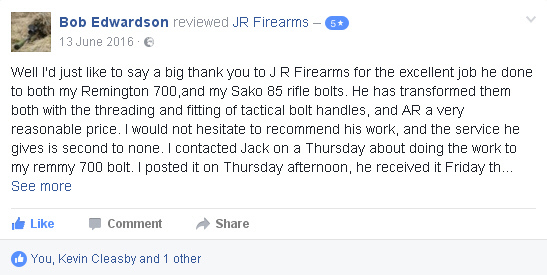 Excellent service from Jack at JR Firearms. I have had my CZ .17 Hornet shortened and a .243 threaded for a mod and a mod supplied. Both guns shoot better than they did before the work thanks to their new match crown. I would not hesitate to recommend JR Firearms for anyone looking to get work carried out on their rifle. Needed threads cut and a moderator fitted to my .308 - dropped it off with Jack on Thursday, and collected it on the Saturday. Fit and finish were excellent - he also made me a thread protector with a knurled finish that does the job perfectly and is very discrete as he blacked it to match my barrel. He supplied a Wildcat Evolution Moderator, and fitted the bushing to my rifle. All this at the best price and quickest turnaround I could find in the UK! Can’t wait to take it out next week. Thanks Jack! I was looking for a .260 rem to shoot the lighter 6.5 bullets. something Like the Sako 85 they don’t list a .260 rem with 22" barrel factory threaded, also a possible 6 month wait? So a quick phone call to jack and after 20 minutes we had it sorted the barrel, the length ,the twist rate, the action and stock and to add a little more a fluted barrel. Once this guy has all the components the build only takes a couple of days the pictures to my phone come thick and fast, it’s a great way to see your build come together if I rang or text he was back to me within minuets he told me at the start I would be impressed so when I went to collect it at the end of November impressed was an understatement I was blown away with the workmanship and couldn’t wait to get home with my new toy I worked up some home loads for it and I was impressed again boy can this thing shoot, even during the shoot and clean process we could see its potential , the rifle and I will improve . 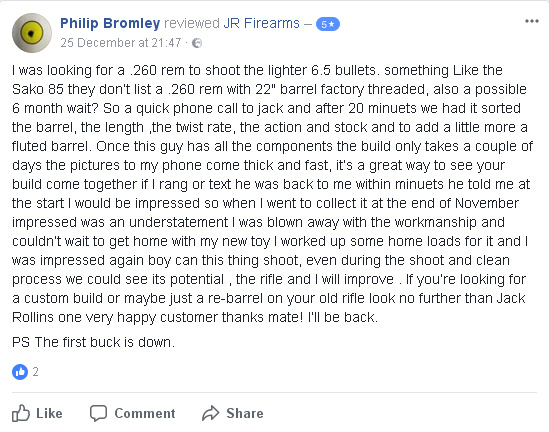 If you’re looking for a custom build or maybe just a re-barrel on your old rifle look no further than Jack Rollings one very happy customer thanks mate! I’ll be back. Click HERE to see a few photos of this build. PS The first buck is down. Jack's a knowledgeable chap who knows his stuff ....does a great job too. Hi Jack, bolt has just arrived and what a superb job many thanks. First class workmanship and first class service Will definitely be recommending you to all my shooting buddy’s. I have Found a Gunsmith that not only will allow you to stay and see the dark arts but to book in and have works done as a while you wait or come back in a few hours his name is, Mr Jack Rollings of J.R Firearms in Bedfordshire. I got this Sako 75 a few weeks ago off the site knowing it had defects the crown was well trashed, after Jack set up the barrel clocked up and cut he went to work like the skilled chap he is. His work shop is clean and very tidy with no clutter to be seen. when he had completed the re threading and perfect crown he set to glass blasting all the action and barrel to remove the crud and pitting. Now its dressed and ready to be used again knowing its as good as it ever was, to say I am happy with Jacks work would not do him justice. So if you guys ever have to get work done with a short time frame and can only get away from work on a Saturday or a Sunday yup Sunday. Jack has told me if he can he will open up and bail you out look him up . He's not big but that means nothing when you turn out first class results. I know he has worked for some top class UK gun makers so don't think he is new to the trade. Thanks Jack very nice to meet you and another big thank you for setting some time aside from your rifle builds to bail me out of a jam. Excellent service, dropped rifle off at 10 am for the barrel to be cut and threaded and it was ready to pick up by 11 30, would definitely recommend. After chatting with Jack we decided to have our Sako 85 right hand and true left hand bolts machined and fitted with his tactical knobs. This was done on drop off and same day pick up arrangement with Jack . Excellent service and superb workmanship. Anyone wanting work done , whipsnade zoo is just down the road a good place to visit while you wait. Just had a new bolt handle & knob made by Jack for my Sako Quad and what a fantastic job he's made once again. I can't recommend him highly enough this is the 4th bolt knob he's done for me now and everyone is so beautifully engineered, the attention to detail is second to none. Speed of service was great, customer interface is equally as good with regular updates. Every time I contacted him the reply was prompt and informative. He put together a package for my rifle to fix the bolt and carry out some upgrades. His pricing was well rounded and I was happy to hand my money over without question as the quality of the workmanship is fantastic! Even when there was a small, and I mean small, amount of damage to the cerakote Jack was upfront and willing to get the item redone free of charge or to knock money off the final bill. 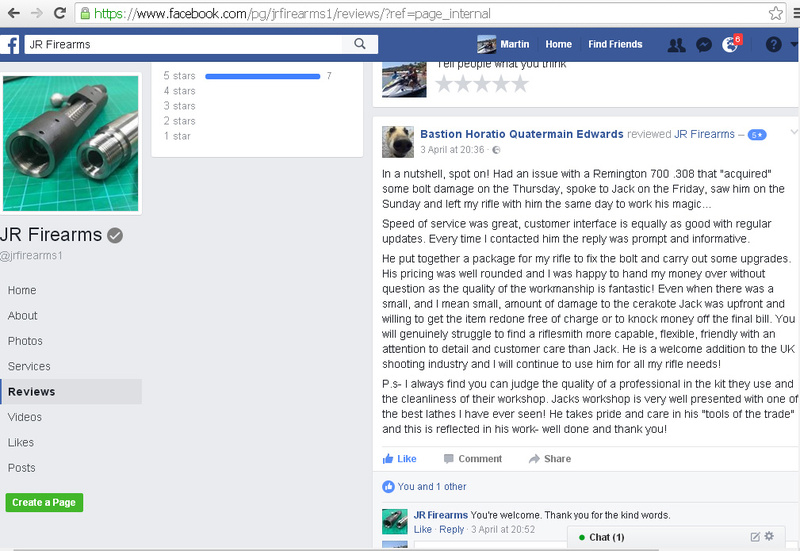 You will genuinely struggle to find a riflesmith more capable, flexible, friendly with an attention to detail and customer care than Jack. He is a welcome addition to the UK shooting industry and I will continue to use him for all my rifle needs! P.s- I always find you can judge the quality of a professional in the kit they use and the cleanliness of their workshop. Jacks workshop is very well presented with one of the best lathes I have ever seen! He takes pride and care in his "tools of the trade" and this is reflected in his work- well done and thank you! 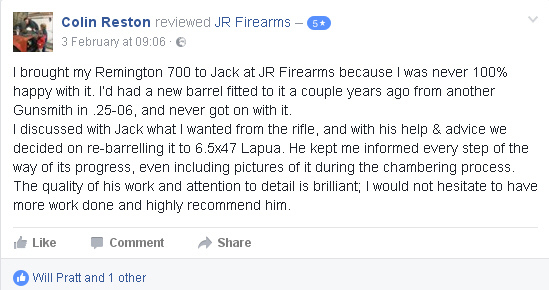 I brought my Remington 700 to Jack at JR Firearms because I was never 100% happy with it. I’d had a new barrel fitted to it a couple years ago from another Gunsmith in .25-06, and never got on with it. I discussed with Jack what I wanted from the rifle, and with his help & advice we decided on re-barrelling it to 6.5x47 Lapua. He kept me informed every step of the way of its progress, even including pictures of it during the chambering process. The quality of his work and attention to detail is brilliant; I would not hesitate to have more work done and highly recommend him. New barrel fitted and action blueprinted, now good for 1200 yards. Precision engineering at its best, certainly a tradesman of extraordinary skills. 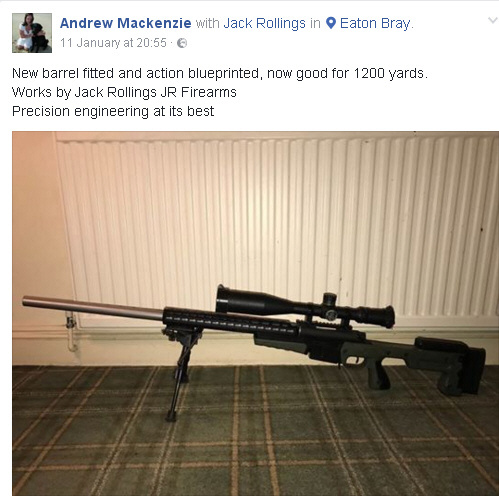 Jack completed a rebarrel on my Accuracy International, the work was flawless and he explained all the machining undertaken, and methods to ensure precision. He takes great pride in showing the finish in his work, even the threads you'd never see when the rifle is assembled. I've dropped my AI in to JR firearms again, for a second barrel to be fitted as a part of the switch barrel system and cannot wait to see the results. I just wanted to say it's been a pleasure dealing with Jack at JR firearms over the last few days. I contacted him on a Thursday to have a tactical bolt knob fitted on my Remington 700, he done a fantastic job on it and I had it back first thing on Monday morning! Couldn't ask for better 10/10 a very happy customer here. Well I'd just like to say a big thank you to J R Firearms for the excellent job he done to both my Remington 700,and my Sako 85 rifle bolts. He has transformed them both with the threading and fitting of tactical bolt handles, and at a very reasonable price. I would not hesitate to recommend his work, and the service he gives is second to none. I contacted Jack on a Thursday about doing the work to my remmy 700 bolt. I posted it on Thursday afternoon, he received it Friday the work was completed Friday and I had the bolt back on the Saturday morning. The Sako 85 bolt was a similar story apart from a day for Jack to modify a jig to fit the bolt in. I will be getting a custom barrel fitted later this year and J R Firearms will definitely be doing the work for me. If anyone wants any firearm work done, then give Jack a ring you won't be disappointed by his workmanship, service or the price. Less than a week ago I sent the bolt from my Howa rifle to be modified by having a tactical handle fitted. This morning it arrived back! What a superb job, real craftsmanship. Right from the start excellent email communication. A very fair price. If you need any work doing on your firearms I would highly recommend JR Firearms. I had called several gunsmiths trying to get my Rugar 10-22 Volquartsen shrouded barrel modified to take a moderator without success. Luckily I found JR Firearms who were the first company who were prepared to take a look at it for me. I explained to Jack the proprietor what I wanted and he quickly came up with the perfect solution. I would definately recommend them to anyone who needs a gunsmith.